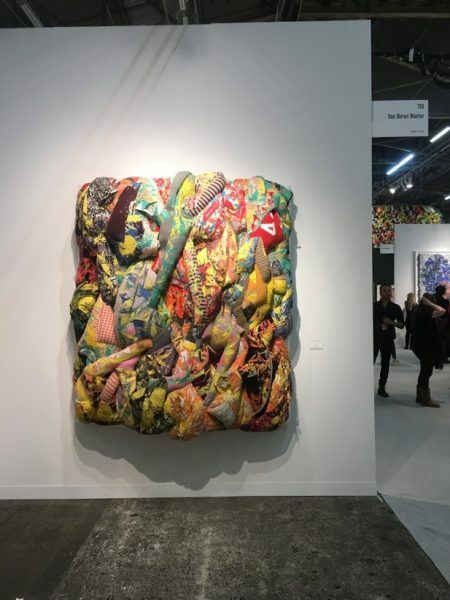 This year’s iteration of The Armory Show marked its 25th anniversary, placing a considerable amount of pressure on Director Nicole Berry to execute the event at the level stakeholders in the art world have come to expect. First launched in 1994 at the Gramercy Park Hotel, The Gramercy International Art Fair has morphed into New York’s premiere art fair, growing considerably in terms of scope and the type of art exhibited. In this review, I will offer a brief overview of the fair’s logistics, note a handful of the broader trends observed during my extended walk-through, and offer short-form analysis of selected works from the fair that deal with notions of language, identity, communication, data, and information. By way of conclusion, I will speculate on the fair’s current state and its future. A general survey of the fair revealed some overarching themes that are worth noting. 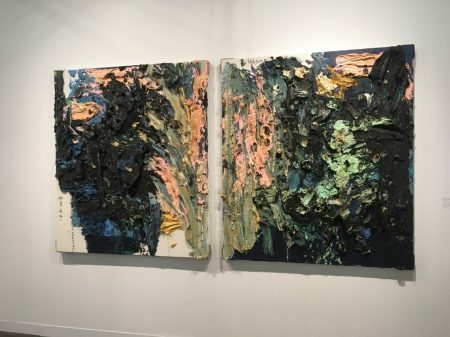 One of the overriding motifs was a strong emphasis on the materiality, weightiness, or expansiveness of wall hangings and paintings, as illustrated in Aiko Hachisuka’s 2018 work Untitled (Yellow) (Figure 1) and Zhu Jinshi’s 2014 oil painting entitled Abstract Rubbish 1(Figure 2). The more intriguing thread uniting a number of geographically disparate artists was a meditation on language, knowledge, information, data, and communication. Works by Moffat Takadiwa, Kwang Young Chun, and Eduardo Navarro offer a glimpse into how some contemporary artists are framing dialogues about these remarkably germane and interrelated topics. Aiko Hachisuka, “Untitled (Yellow)”, 2018. Silkscreen on clothing, kapok, upholstery fabric, foam on wood, 72 x 64 x 20 inches. Van Doren Waxter. Zhu Jinshi, “Abstract Rubbish 1” and “Abstract Rubbish 2′, 2014. Oil on canvas, 63 x 55 1/8 inches. PearlLam Galleries. 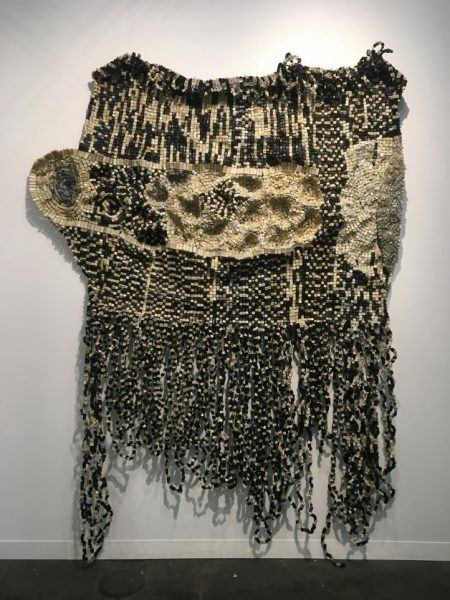 The booth for Nicodim Gallery (824) at Pier 94 featured five exemplary sculptural tapestries by the Zimbabwean artist Moffat Takadiwa. Possessing strong formal affinities with the work of El Anatsui, Takadiwa’s work is composed of found computer keys and fishing wire, offering a postcolonial critique of former British occupation and the residual complications left from imperial rule. From a distance, the work recalls kinked spools of film tangled up with an assortment of sartorial accessories (Figure 3). Closer examination of the surface reveals that the long strands are in fact a woven quilt of square keyboard nodules. The weighty, speckled tapestry is suggestive of a scaled model of a landscape, filled with varied topographical features, such as faults, rifts, ridges, valleys, and hills. 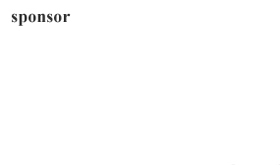 Each key, mark, function, or character might be taken as a parcel of land on this irregular grid of commands (Figure 4). The link between land and language is one of the driving forces behind Takadiwa’s work. 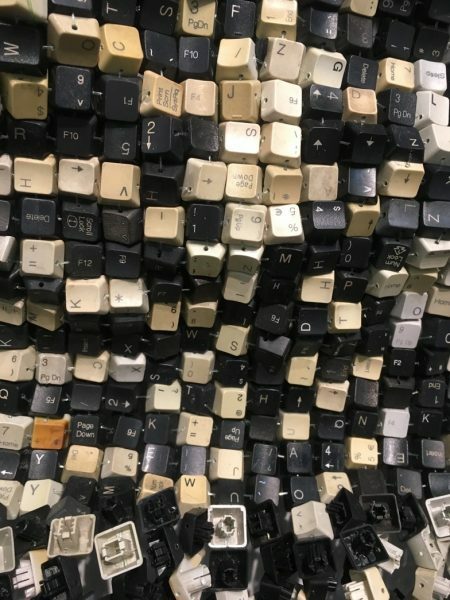 Significantly, the found keyboard components were once used by colonial administrators to record population data and demographic details on subjects of Rhodesia (the British colonial name for Zimbabwe). Keyboard functionality is of course linked to binary code and logic. This aspect speaks to how Zimbabwe’s independence is not simply a matter of returning to life before colonization. There is no action or process that can restore or reset Zimbabwe’s social, political, and cultural life, as there is on a keyboard (i.e. “esc”, “delete”, or “restart”). As Takadiwa has noted, colonization had the irrevocable effect of establishing English as the official language, continuing to be a prerequisite in maintaining a professional life. Like many other nation-states colonized in the 20th century, Zimbabweans live in a state of parallax—forever altered and displaced—seeking to reconstruct their own sense of identity. Takadiwa’s work is one approach to reconstruction, voicing critiques of British colonialism in a visual language that is independently his own and intimately tied to his land. Detail of Moffat Takadiwa’s wall hanging of found computer keys and fishing wire. Like Takadiwa, Kwang Young Chun draws on elements of his nation’s colonial history to create a distinctive visual idiom that engages in discourses about language and construction of identity, personal and artistic. For Chun’s Aggregation 08-F0001 (Figure 5), the obvious visual point of reference is an asteroid, or the surface of an extraterrestrial body that has been bombarded with interstellar debris. The title encourages this line of reasoning because its structure is comparable to the nomenclature used to identify and categorize galaxies, comets, and myriad celestial objects. Alternatively, the impressive arrangement of individually wrapped parcels might call to mind the inner cavities of geodes, bundles of food, or even packaged art supplies. However, the densely packed and variegated work is based on Chinese medicinal packets wrapped in Mulberry paper (hanji), items the artist encountered in Korean apothecaries when he was young. Chun has drawn upon this historic tradition and made it a foundational element of his work since the mid-1990s. 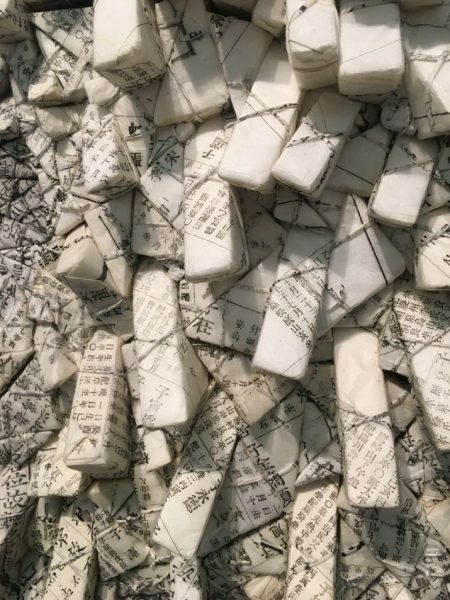 Instead of pharmaceutical texts, though, the artist uses old book pages containing Korean and Chinese philosophical tracts. When these pages are folded, the texts are consequently fragmented, felicitously forming unexpected combinations of ancient names, cites, and phrases (Figure 6). Interestingly, the blackened pieces represent censored knowledge or information. Kwang Young Chun, “Aggregation 08-F001” (2008), mixed media with Korean Mulberry paper, 76 3/8 x 63 3/8 inches. PearlLam Galleries. Whereas both Takadiwa and Chun are concerned with interpreting, understanding, and reconciling past events and texts, Eduardo Navarro is more invested in the future life of present material that he alters in an ongoing phenomenological project called Letters to Earth. He has mounted this particular installation several times, including once at Cologne Sculpture Park. Letters to Earth #4 (2017) is a square plot containing 100 bronze-encased and vacuum-welded nuts (Figure 7). This process or treatment extends the life of the encapsulated nutmeat and contract by thousands of years. 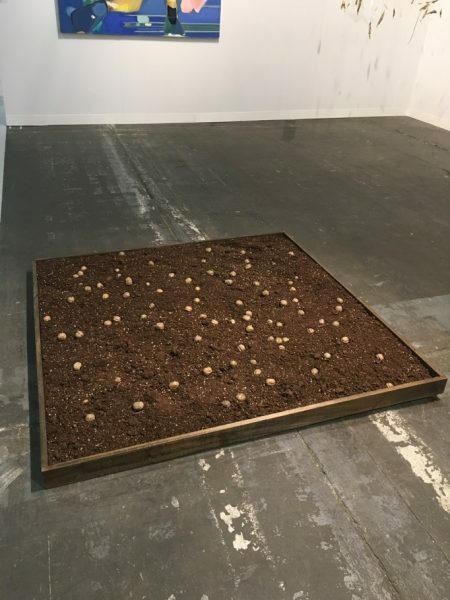 The arrangement of the small bronze objects—curiously resembling futuristic space pods—on the bed of soil summons forth ideas of impregnation, fertilization, and growth. A hallmark of the Argentine artist’s practice is altering humans’ perceptions. In this case, Navarro plays with the fact that bronze, walnut wood, and walnut oil have traditionally been used in the production of sculpture, panel boards, and oil painting. Historically, artists have manipulated these materials in order to construct images and objects that convey messages. In an abstracted manner, Navarro uses these products to craft conceptual epistles; however, much of the content of the eco-critical message is wrapped up in the process of intervening in the life of the materials. Further, as the title suggests, Navarro’s message is not necessarily intended for future inhabitants of the planet, but rather for the earth itself—a capsule similarly preserving life. The Armory’s 25th anniversary naturally occasions a consideration of its continued relevance and viability. As Julia Halperin and Tim Schneider recently posed, have art fairs reached a point of saturation—and by extension outgrown their utility? The artnet News reporters note that many dealers, collectors, and advisors are feeling less pressure to attend every major fair, and the parent companies that manage art fairs are scaling back plans to expand new regional offerings. [iv] In general, many in the art world would agree that fairs have ballooned beyond their usefulness over the past few years, exhausting resources, galleries, and collector bases. That is not to say that they ought to be dispensed with entirely. Certain fairs remain convenient for new collectors because it allows them to see a sweeping selection of work in person while at the same time providing advisors the chance to guide young and seasoned clients. Moreover, fairs remain an important venue for exposure for curators, in addition to artists. To my mind, as the fair landscape evolves, The Armory Show’s vitality and significance depends on staying committed to showcasing a mix of emerging and established galleries; periodically adjusting the price of participation, as Genocchio did in 2017; encouraging more experimentation within the Focus and Platform sections; and augmenting the Armory Live Talks by offering a greater variety of topics and inviting a more diverse set of art world players to participate in debates. [v] So long as the leadership keeps a close eye on these critical fair components, The Armory Show will retain the hegemonic status it enjoys inside the realm of international art fairs. More importantly, it will continue to be a nexus of discovery and conversation for artists, gallerists, curators, critics, dealers, advisors, collectors, and patrons. [i] Forbes, Alexander. “Benjamin Genocchio on Making The Armory Show Relevant in Today’s Market.” Artsy. February 24, 2017. [ii] Jovanovic, Rozalia. “Armory Show Director Nicole Berry Looks Back on 25 Years of the Fair.” Galerie. March 7, 2019. [iii] Kwang Young Chun currently has an exhibition on view at the Brooklyn Museum of Art until July 28, 2019. Brooklyn Museum. 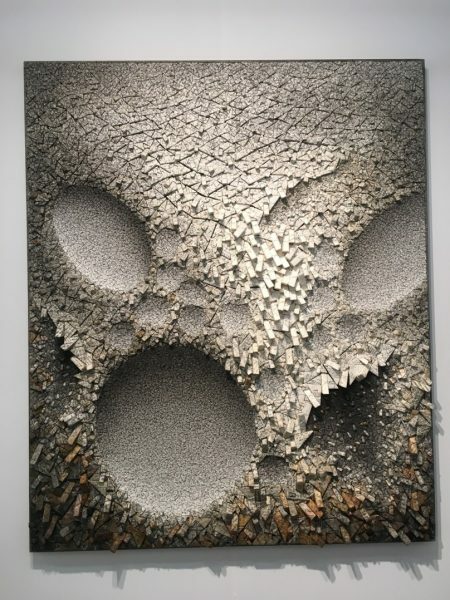 “Exhibitions, Kwang Young Chun: Aggregations.” Accessed March 27, 2019. https://www.brooklynmuseum.org/exhibitions/kwang_young_chun. [iv] Halperin, Julia and Tim Schneider. “Are We at ‘Peak Art Fair’? Collectors and Advisors Say They’re Hitting Their Saturation Point—and Something’s Got to Give.” artnet News. March 11, 2019. [v] In 2017, Genocchio, lowered the price of participation by 40%, to under $10,000. See Forbes, Alexander. “Benjamin Genocchio on Making The Armory Show Relevant in Today’s Market.” Artsy. February 24, 2017.